A lot of work goes into setting up a blog, and in order for it to be successful you have to effectively be planning blog posts. Blogging isn’t as simple as just writing something and then hitting publish. There is a lot of behind the scenes work to writing that stellar blog post. A lot of work goes into setting up a blog, and in order for it to be successful you have to effectively plan and organize your blog posts. Blogging isn’t as simple as just writing something and then hitting publish. There is a lot of behind the scenes work to writing that stellar blog post. The first step to plan and organize a blog post? Generating a great post idea through brainstorming. When planning and organizing blog posts brainstorming is the way to go. Brainstorming is creating ideas and forcing them out of your brain. No matter what ideas enter your head while you are brainstorming, write them down. You may not use all of the ideas that you brainstorm, but all ideas can possibly point you in the right direction. *TIP When you brainstorm you can use a GIANT piece of paper. If you are like me, my brain needs lots of clean space to write and generate blogging ideas. You can fit tons more ideas on a big sheet of paper. Figure out how your brain works, and accommodate it to get the most out of your brainstorms. Perhaps you need to create a graphic organizer, or you need to draw pictures to really pull those million dollar ideas out of your head and onto the paper. You may even set aside a specific day of the week or month to do your brainstorming. You will see your recent searches and under that you will see “Trending Ideas”. Now these trending ideas may have nothing to do with your blog, but if they do bingo! you just got something to blog about! You know what people are already looking for and you can write a blog post around it. You can search something you may be thinking about creating a blog post for on Pinterest. Perhaps you have a DIY blog and you are thinking about making slime. You can go to Pinterest and type in the search bar “How to Make Slime” As you can see, I typed that into the search bar and out came a bunch of other searches underneath that in the colored boxes. So by using Pinterest’s suggestion, you will have more of an idea of how you want to write your post. How to Make Slime – For Kids! Would be a great title and it’s already being searched for. There are so many ideas and people who have made slime you could even do a round up post of the best slime recipes and link all the bloggers who are making great slime recipes. With Pinterest, the inspiration is endless. I have a blog post that explains some more Pinterest Strategies if that’s your thing. Systems are a way to almost duplicate yourself. Once you have a system in place, they kind of work themselves. No one is going to do your work for you unless you hire an assistant. BUT if you have a great system your assistant can follow along your exact system. Boom, you just duplicated yourself! Whatever system you use, write it down. Then it can be followed. You can always update your system as your blog evolves. Create a Master Task List. A master task is a system that will list generically list all the tasks that you need to do each week to produce your blog posts. When this whole blogging thing was new to me, and I was kind of stumbling along (rightfully so I might add) because the learning curve for a new blogger is steep. The sheer volume of blogging tasks I had to do was quite daunting. I’m a super organized person, but I wasn’t sure what to do until I played around blogging for a bit. A blogger not only needs to to decide what to post, but what to write, research, photograph, edit, design, optimize, and promote. That’s a whole lotta stuff right? Creating a master task list that you can follow each day will have you planning and organizing blog posts in no time flat. You will be ready in every area by the time they are ready to go live. Planning and organizing blog posts is easier when you use batch your tasks. Batching tasks is when you do all of your like tasks together saving you time, effort, and energy. When you are constantly switching gears, you lose valuable time and creativity. If you stay in one gear by doing the same thing by batching your tasks, you will be more productive and get more things done. A Master Task List is a great place to ramp up your blogging goals. You just follow the list and off you go. If your goal is to publish a blog post once a week, a master task list is where you can do just that and even work ahead. Batch your work and get a few weeks ahead in your posting schedule. That will take some of the pressure off of you. I like to write and plan my posts out in Word or Pages. A word program helps with the content creation process because you can use these programs even when you don’t have an internet connection. I spend a lot of time on an airplane ✈️ and traveling. WiFi is often unreliable on an airplane and if you use MS Word or Pages you can keep working on your blog posts even without a WiFi signal. A printed copy of your blog post allows you to make marks on your rough draft. I feel like when you first start blogging printing your rough draft can be super helpful. Especially if you are kind of new to writing. When you have a hard copy of a document you can more easily see your mistakes. If you use a pen or pencil to mark out mistakes, rearrange paragraphs, and change-up your headings and subheadings you can find mistakes easier than if you are looking at a screen. I love the physical act of writing, it’s so special. It’s kind of like the difference between reading an ebook and an actual physical book. Ebooks are great but there is something about holding a book in your hand and reading. Do you write your blog posts first on paper? Or do you type them and not write anything down? Typing is much faster, so by printing out your post you can mark up the hard copy, draw arrows, put lines through things you don’t like, and rearrange to make things work. Plan and Organize Your Blog Posts With a Blog Planner. Planners make such a huge difference in organization! I’ve created a Printable Blog Planner that has different parts for all of your blogging needs. The PBR Planner is Buildable, meaning you can build it as you go. If you are the type of person who likes to plan and write things down on paper then the Plan Blog Repeat Blog Planner will help you plan and organize your blog content. The type of planner you use is really personal preference. There are so many types, the possibilities are endless. My Filofax recently met it’s untimely death, (lets *pause* for a moment of silence in her honor). The Happy Planner is a perfect accompaniment to The PBR Blog Planner. Write your post titles on a post it, so you don’t have to write in your planner before you have decided exactly what post you want to publish on which day. If you want to move your blog posts around, you can simply peel up the post it and move it to a different day. You Can Use a Separate Planner for Business. I find it most organized for the blog when I don’t mix business planning and personal planning. *UPDATE Since I created the PBR Blog Planner I am able to successfully mix my business and personal Planner. I finally have reached planner peace and you can too. Planner Peace is when you have complete peace about your planner. I used to need to have separate planners for business and personal use. Busy Mom’s need a lot of space for planning and two planners didn’t used to work for me. With the PBR Blog Planner I have so many different blog planning inserts that they do take up some space, but what you can do is only leave three months in your planner at a time. The previous month, the month you are in, and the next month. Planning 3 months at a time in your planner can really maximize the space for your blogging needs. You can have a content calendar, content outlines, and so much more. You can have a personal section in your planner for kids activities and more. By having a complete planner dedicated to blogging, you can keep everything in one place, completely organized and easy to follow and find. Planners are fantastic for organization. Writing things down not only gets you organized but it makes things happen! Paper planners are awesome but digital planners have a place in the world too. A paper planner needs to be open and in front of you to be effective. A digital planner, like iCal can pop up reminders to your throughout the day. A digital planner can pop a reminder to your on your watch, phone, or computer. That’s a great system to really keep you organized. All of your electronics can work in harmony to keep you on schedule. A digital and a paper planner can both work together. Pick which days you would like to post, and stick to it. If you are just starting your blog, it’s not so much of problem if your posting is sporadic because you don’t yet have traffic and may not even want it. When I first started blogging I didn’t really want traffic. I know that probably sounds ridiculous but I wanted to learn and make mistakes without an audience watching me possibly fail. However, it’s never too soon to establish a posting schedule. The sooner you get traffic and your blog up and running the better! There is so much to do when starting a blog. With all of the blogging tasks you need to do it can all feel totally overwhelming. A posting schedule helps get your posts planned and written in a timely manner. A posting schedule will help you stay on track planning and organizing your blog posts. An editorial calendar will take your blog planning and organizing to another level. A great goal to have is to plan your blog posts a year in advance. If you can manage to plan out enough blog posts for an entire year of content, you won’t run out of blogging material. You don’t have to write an entire year of blog posts at one time. Just coming up with blog ideas is a great start. You can use an electronic editorial calendar or a paper one. I personally use a month at a glance inside my PBR Blog Planner. You can keep a running list of blog post ideas. Once you have that running list you can draw from those ideas to fill in your editorial calendar. You can plan blog posts as far in advance as you can manage. As long as your blog content is evergreen, the farther your content is planned the better. If life throws you a curve ball or two your blog will never suffer with content planned in advance. Don’t be afraid to switch up your editorial calendar. You may want to move posts around. Do whatever suits you. An editorial calendar is to help you effectively plan and organize your blog posts. If you have to rearrange that’s just part of the organization process. 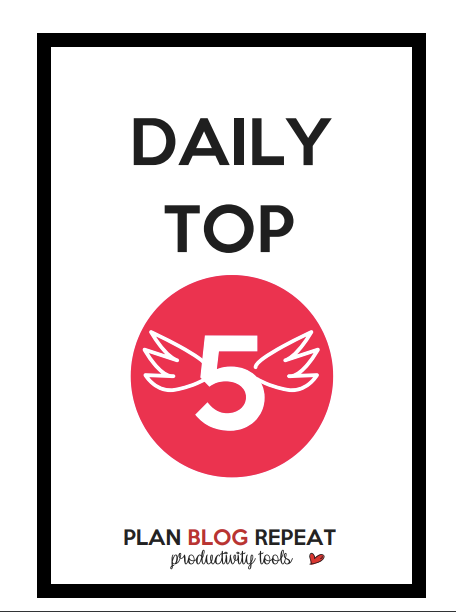 I created a free blog post cheat sheet just for the Plan Blog Repeat readers! This cheat sheet can be used in your very own Blog Planner for easy reference. I created a free blog post cheat sheet just for my readers. This cheat sheet can be used in your very own blog planner for easy reference? Don’t have a blog planner? Print this out and you’ve got the start of a blog planner. The Blog Post Cheat Sheet is a useful way to organize your blog posts. Not only does it help you to make your blog post more reader friendly, but also search engine friendly. What blogger doesn’t want that? Just fill in your name and email address below to grab this awesome freebie! I love that idea of using the giant board above the sink!!! I have to try that. The bigger things are in front of me, the more I look at them. Thank you for that helpful tip. ?